You know how I know that I’m living right? I’m surrounded by amazing, talented, creative people. 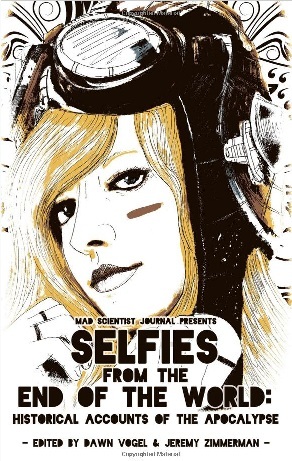 Around about the time I was scaling back on this small press thing, frequent collaborators Jeremy Zimmerman and Dawn Vogel started doing this great publication called Mad Scientist Journal. If you haven’t checked it out, I encourage you to do so as it’s free to read online. Or you can get the quarterlies in print or e-book for the device of your choice that contain fun bonus material like classifieds. It’s an inspired project and it fills me with joy knowing it’s out there. Last year they put together their first anthology, That Ain’t Right: Historical Accounts of the Miskatonic Valley which I was delighted to be published in. “Goat,” my story for that, was a short piece about Texas high school football and New England traditions that go back a bit further. This year, they were talking about something a little different–an anthology of end of the world stories inspired in part by a poem that Dawn Vogel had found online. Now, end of the world stories really aren’t my thing. I mean, I’ve read my share, and l love them. “The Nine Billion Names of God” by Arthur C. Clark (1953) is a particular favorite. And as the anthology began to take shape, I got talking about possible end of the world scenarios with Dawn. Somehow, and I’m not entirely sure how, I promised her a story about werewolves. God as my witness, I really don’t know how that happened, as I’ve never written a werewolf story before. But I started to get obsessed with the idea of what the end of the world could mean. Somewhere in there, I found a story about a manly kind of man, a former logger in a small town in Oregon that’s changing before his eyes, a story about a man facing a very personal apocalypse as muddy pickup trucks are replaced with Subaru hatchbacks with “Organic” and “Eat Local” bumper stickers. Thus was “The Last Real Man” born. I wasn’t really sure if it was what they were looking for, but hey, they accepted it. Then I saw the cover and I started to get excited. I’ve been reading my copy since I got it and I’m blown away. They’ve managed to gather 23 stories from around the world, paired them with a sharp layout and gorgeous interior art, creating an anthology I’m crazy proud to be a part of. So, if you’re a fan of small presses, check Selfies from the End of the World out. Jeremy and Dawn are the real deal, a pair of inspired editors with a great eye for a talent who sacrifice sleep and sanity to put out an amazing product. If you’re a fan of apocalypse stories, they have 23 of them for you, each one a gem. And if you’re a fan of werewolf stories, I have something weird lying in wait starting on page 81 just for you.